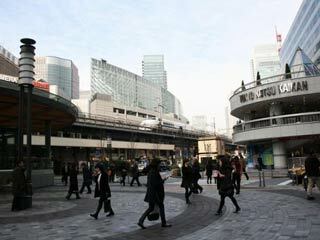 Yurakucho(有楽町) is located next to the Tokyo Station. Yurakucho itself is the shopping district, but because it is surrounded by Marunuchi and Ginza, it is very convenient shopping spot with all range of the price. Also, because it is located in the middle of business district (Otemachi, Marunouchi and Shinbashi) there are many restaurants and bars. There is parking. Patio is open park open public complexes where you can have lunch or meeting. Yurakucho was named after Oda Urakusai, a younger brother of Oda Nobunaga. Urakusai, who was also renowned as a tea master, received a residence from the Tokugawa Shogun under whom he served after the battle of Sekigahara. SInce Urakusai's residence was located at Sukiyabashi Gomon, the town was called Yurakucho. Grid-shita is the favorite Izakaya (Japanese Bar and Grill) spot for Japanes business men those who especially work around Tokyo Station and Kasumigaseki. There are 100s of restaurants and Izakaya located under the train grid.